It’s Independence Day weekend in Costa Rica, and the beach party starts early. I’m at Playa Herradura—just west of the bustling capital of San José—where the locals go to enfiestarse under the sun. By 10 a.m. the beachfront is like a stadium parking lot on game day. People pull up on the sand, pop the trunk, and tailgate. They watch fishing boats come and go and try to avoid the oily films the boats leave in their wake. No turtles nest here, nor do dolphins frolic. Here, people are the wildlife. But I’m not here to party. I’m helping my wife, Yolanda Camacho Garcia, a marine biologist at the University of Costa Rica, search for sea slugs. These charismatic distant cousins of snails range from pea-sized to 30 centimeters long. These underwater jewels are some of the most colorful and eye-catching creatures in the ocean. They’re also some of the best camouflaged, matching the color, and even the texture, of the algae and sponges they eat. They’re sensitive to light, water temperature, and, most of all, pollution and human disturbance. Surely we’ll find none here. We grab our snorkels, weave past partiers strolling the sand with cans of beer, and slip into the sea. Within the hour I find a slug. It’s a common species, but I’ll take it—I usually get skunked. Then I find another one. Excited, I kick over to Yolanda. She’s been free diving, searching more than three meters down. “This place is a hotbed!” she says as she surfaces, holding a water bottle full of the creatures. My pride is deflated, but I’m energized to keep searching. By day’s end, we’ve collected 33 species, including three new to science. Some are uber-rare, including a pink-and-tan cutie the size of a baby’s fingernail, first discovered in a reserve by Yolanda—15 years ago—and never again seen. Until now. In this unlikely place. Perhaps the biggest find of the day? Despite the human disturbance, we see silky ribbons clinging to rocks and floating in the water column. They’re sea slug eggs and they’re everywhere. We’ve stumbled across a vibrant breeding ground—an indicator of a healthy environment—at an overused and abused seashore. And no one but us has noticed that at this party beach the fiesta continues, below the water. 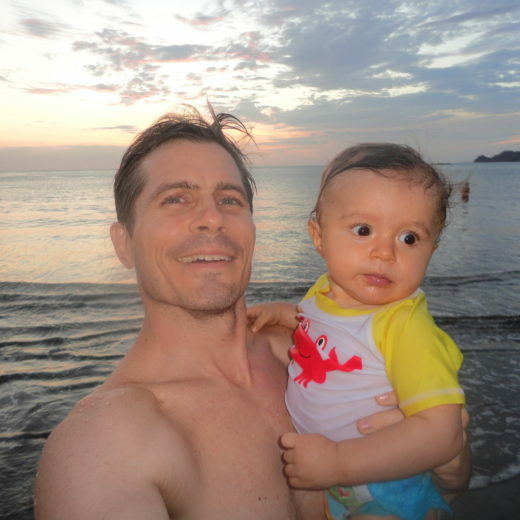 David Butvill is a freelance science writer living in Costa Rica. A long-time columnist for BBC Wildlife magazine, he writes about science and nature for various magazines and the radio. He thanks his son Nikolas for keeping him young at heart and interested in life’s little treasures (and their place in big issues). Cite this Article: David Brian Butvill “The Party Slugs of Costa Rica,” Hakai Magazine, Apr 22, 2015, accessed April 23rd, 2019, https://www.hakaimagazine.com/article-short/party-slugs-costa-rica/.